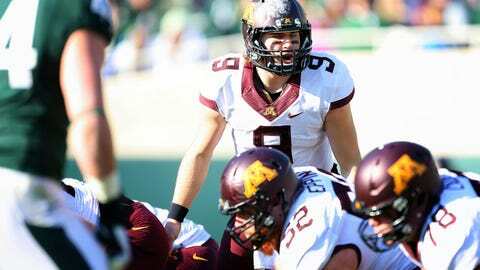 Gophers quarterback Philip Nelson was forced to leave a 14-3 loss Nov. 30 at then-No. 11 Michigan State that ended the regular season. If Minnesota has bitter memories of last year’s Texas Bowl that ended hopes of a winning season, it will have a chance for redemption in the very same game. Syracuse, meanwhile, has an opportunity to show the Golden Gophers that it is a much-improved team than the one which lost to them a season ago. Both teams are known for solid rushing attacks as they get ready for their matchup Friday in the Texas Bowl in Houston. Minnesota (8-4) finished last season at 6-7 with a 34-31 loss to Texas Tech in this bowl, blowing a seven-point lead in the final 1:10. "We enjoyed our experience last year and wish we could have come away with a victory," coach Jerry Kill said. "I know our players, especially the 12 from Texas, welcome the opportunity to represent the University of Minnesota in a state that has great football tradition." The Golden Gophers are seeking their second nine-win season in 108 years, and reaching that milestone has created plenty of incentive. "We have a great opportunity to compete and continue to make history as a team," Kill said. "Nine games, winning nine games is important to us, winning a bowl game is important to us." Syracuse (6-6) endured an uneven first season under new coach Scott Shafer. The Orange lost both coach Doug Marrone and quarterback Ryan Nassib to the NFL before their first season in the Atlantic Coast Conference. That’s why last season’s meeting in which Minnesota won 17-10 at home Sept. 22 figures to have little impact in this game. Neither quarterback that started that contest is back. Another difference is that the Golden Gophers didn’t have running back David Cobb in that one. Cobb was sixth in the Big Ten with 1,111 rushing yards along with seven touchdowns in 2013. "They’ve got a doggone good running back in Cobb," Shafer told Syracuse’s official website. "He can run the football and he runs it well because they block it well up front. They’re a sound, tough team. They’re going to be a team that doesn’t shoot themselves in the foot." Cobb is one of the Texas natives who expects plenty of support from the crowd. "It’s a great opportunity for us to go back to Texas and for me to play in front of the home crowd and make a good impression and for our team to get nine wins," he said. Shafer’s presence also adds an intriguing twist since he was the defensive coordinator at Northern Illinois from 2000-03 when Kill was at the other end of the state coaching Southern Illinois. Kill later became coach at Northern after Shafer moved on. "He’s familiar with us because we’ve known him and we’re familiar with coach," Kill said. "So that makes it interesting and that makes it a lot of fun because he’s a great football coach." Shafer also likes to run the ball as Syracuse finished fourth in the ACC with 193.8 rushing yards per game. Jerome Smith, who had 11 rushing touchdowns and 840 yards on the ground this season, gained 52 yards on nine carries in last year’s meeting. Who controls the line of scrimmage will be critical since neither quarterback figures to be called upon often to make plays. The Orange had the ACC’s third-worst passing attack with 181.5 yards per game, while the Gophers ranked last in the Big Ten at 141.8. Minnesota’s 237 pass attempts are the sixth-lowest total in the FBS. The Gophers were picked off seven times. "They don’t throw a lot of interceptions and they play a good, tough brand of football, but it’s the run game first and foremost," Shafer said. Gophers starting quarterback Philip Nelson was forced to leave a 14-3 loss Nov. 30 at then-No. 11 Michigan State that ended the regular season, with Mitch Leidner finishing up. Orange quarterback Terrel Hunt will have to be wary of Minnesota senior defensive back Brock Vereen, who feels that last year’s experience in Houston gives his team an edge. "I think it’s definitely an advantage that Syracuse won’t have," Vereen said. "We’ve been in that city, we’ve practiced at that high school field, we’ve played in that stadium so it’s definitely something to be excited about." Minnesota has won three of four meetings between the schools. Syracuse’s only previous bowl appearance in this state was a 23-14 victory over Texas in the 1960 Cotton Bowl.